Look familiar? In his Destinies series, celebrated Quebec Artist, Louis Boudreault, portrays some of history’s most influential artists before they were famous – in fact when they were children. Selecting subjects who have inspired him, and whom he admires, Boudreault captures the innocence and purity of childhood, while giving a nod to their illustrious futures, yet unknown to the subjects themselves. At Galerie d’art Vincent, we are very fortunate to have pieces from this series, in particular Pablo Picasso and Alexander Calder, two of the 20th century’s finest artists (other subjects include Vincent Van Gogh, Charlie Chaplin, Elvis Presley, Marlene Dietrich and many others). Depicted around the same age, it is not hard to see the spirited potential in the early portraits of these artists. Using additional imagery to connect the subject to their own art, Boudreault has captured the innocence and beauty of childhood, as well as the undeniable magnetism of the artists themselves. These pieces also allow us to see the unlocked potential in the children among us; no one knows who will become the next Picasso, or Calder, but every child has within them a secret future that has yet to be unlocked. 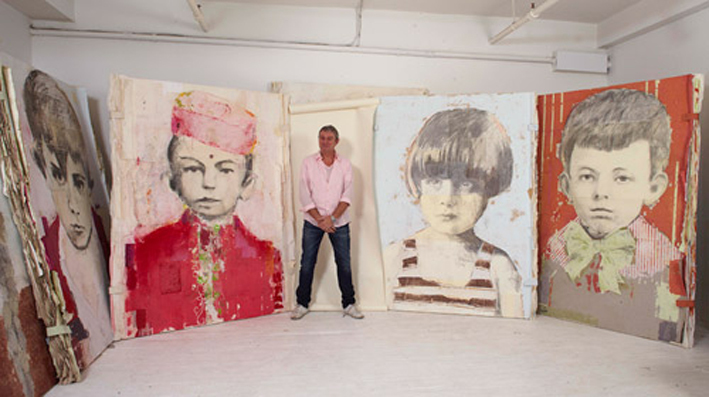 We can see ourselves, or children we know, in these portraits, giving a unifying feeling that we are not all that different than these artistic masters. The paintings also take us on a journey through time; because we already know the identities and futures of the children depicted, we are transported through the decades of their work, and legacies, and back again to childhood. A dialogue is created in the mind between the work, and what we already know of the subject. In this way, we see them as both young, and old simultaneously; as both innocent and wise. In a culture that is increasingly preoccupied with nostalgia, Boudreault’s work appeals to the sentimentality of memories, and our idolization of artistic greatness.